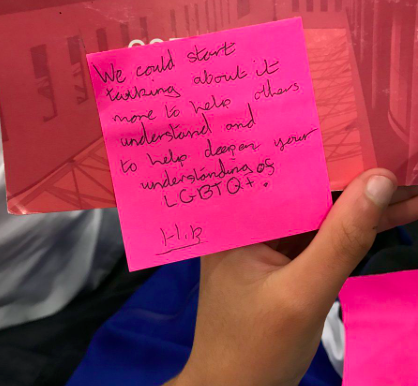 Alice has been working with us to open conversations around LGBTQ+ at schools across Greater Manchester, here are some of her reflections on how we can continue to learn and be a better ally. Assisting the delivery of Art with Heart’s Equalities Workshops has been a pleasure! Going to work and doing loads of learning and challenging… Thanks very much – I’ll take that. One of the first provocations Sarah gives the participants (who are aged 12 & 13 and the teachers if I can persuade them!) of the workshops is to have a chat about examples of equality and inequality in the world right now. This can be either in their lives or things they’ve seen on TV or the internet etc. In those chats alone, young people taught me about what they knew about Israel and Palestine and made me want to go home and find out more, about a supply teacher who split a class in half: ‘1 half white, one half black kids’ (who has since been sacked) and a dad who only ever gets personal in his road rage about bad drivers on the road if they’re not white or if they’re a woman. Sometimes we talked about Trump and why he wants to build a wall and if we can think of anything like that going on in England or in our own communities, towns and cities or about the bomb at the Ariana Grande concert, the gender pay gap or why women’s football is called women’s football and not just football. Peers disagreed with each other and vehemently agreed and disagreed again. We held votes and laughed at how it is all a bit too complicated. This was the first provocation. It’s an ambitious workshop. It doesn’t patronise its participants and the conversations that take place are testament to that. Sarah makes it clear she wants to know what you really think and I observed most of the time the young people testing that with things like ‘I don’t care about politics, why should I care?’ without the fear of getting told off. The sessions develop into focussing on LGBT history. I’d like to consider myself a good ally to the LGBT community but I still came away from assisting these workshops having learnt A LOT. I didn’t know that the T in the acronym actually stands for ‘Trans’, about the nuance of what it is to feel safe enough or ready to come out to their family, and that more people than I had realised still speak about LGBT people as if they do not exist in certain communities – particular some religious ones. I learnt that the Proud Trust website can probably teach me almost everything I want to know and learn to be a better ally! When a room is created based on equity, where you can teach me and I can teach you and then neither of us are sure so we’ll Google a fact and move forward together, then things shift. The workshops end with everyone writing a pledge to make a change in support of the LGBT community. Something active, practical, that you can put into place from today. Some pledged to call out homophobic and transphobic language. Some pledged to stop using it. Some pledged to be kind to be people who might be struggling with coming out at school. Some students thought they were pretty good allies already. So did I. But there’s always room to learn and listen some more.